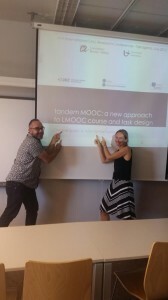 In occasion of the XVIIth International CALL Research Conference in Tarragona (6-8 July 2015), Christine Appel from the Open University of Catalonia and Joan-Tomàs Pujolà from the University of Barcelona presented “Tandem MOOC: a new approach to LMOOC course and task design”. The paper is based on the Tandem MOOC experience carried out in the period October-December 2014. During this MOOC, students from all over the world had the opportunity to practice their speaking skills in their target language (Spanish or English) with their language partners by carrying out online tasks through the SpeakApps tools. Some of them reached a total of 20h of conversation in 6 weeks, which is unusual in a common language course. Some students are eager to take the course again and we had several requests for a new edition, as it is possible to see in the Facebook fan page created for them in occasion of the MOOC which is still active today. In all likelihood, the next edition of Tandem MOOC will take place next spring term and some changes and improvements are expected. For more information keep reading this page and the Facebook fan page. In the meantime, in the next posts we will provide some of the results related to the past edition of Tandem MOOC. Stay tuned here!